Today, the Cluster da Saúde RS has over 500 registered participants that come from industrial, scientific, medical and economic professions. The management board organizes regular meetings and keeps close contact to the partner cluster in Germany. An intense exchange between companies and universities between Brazil and Germany bring new economic opportunities and scientific collaborations. An example is the participation at international fairs. 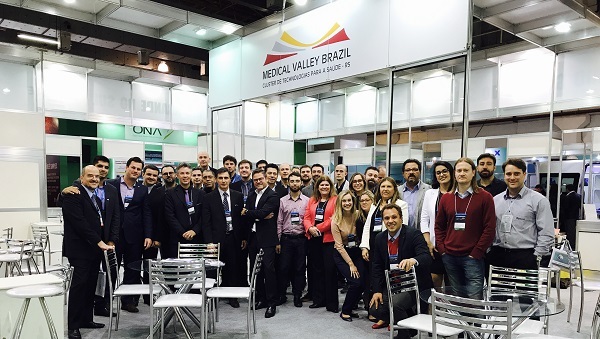 In November 2017, there were two simultaneous fairs in Germany and Brazil – the world’s largest fair for Health, MEDICA in Düsseldorf where 20 companies from the Brazilian cluster have participated and the Econtro Economico Brasil Alemanha (EEBA) in Porto Alegre where another 12 companies from RGS have demonstrated their products. Working together as a group and showing a collaborative infrastructure gives the Cluster da Saude a very good standing and a high credibility. Changing the mentality of the partners in Brazil to a transparent and very collaborative behavior was probably the biggest challenge but shows some great results today. 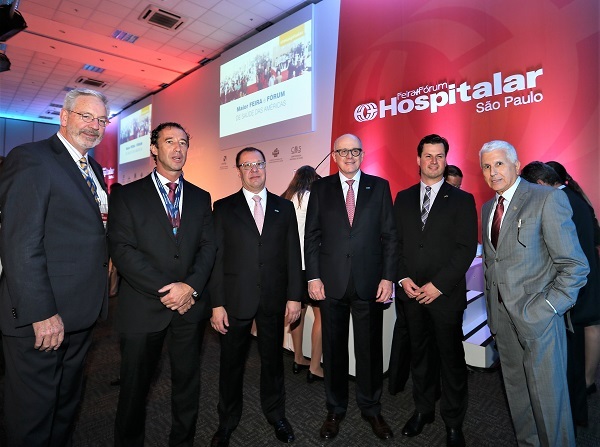 During the opening ceremony of the Hospitalar, the most important show in the healthcare sector in the Americas. It provides the ideal platform to launch products and present innovations, solutions and services for hospitals, laboratories, drugstores, private practices and clinics. From left to right: Joachim Schäfer (Managing director of MEDICA Germany), Franco Pallamolla (president of ABIMO Brazil and CEO of Lifemed Ltda), Paulo Fraccaro (Director of ABIMO), Tobias Zobel (Managing Director of ZiMT and COO of CiNNAMED) and Francisco Santos (president of the Couromoda/Hospitalar Group).